Ambitions and How to Choose What to Study After SPM? Sijil Pelajaran Malaysia or more known in the short-term as SPM, is the so-called life deciding test that will mirror your future and remaining of your life in this world. Is it true? Well for me, it’s not. Education is good, great actually. However, since SPM is over-rated and people start to think student’s future depends on it, education becomes a pain in everyone’s life (mine included). However, what I’m trying to say is not that SPM is not important, let’s just not care about it. No, nope, and just NO. What I’m trying to say is that SPM is just a bridge (a fast lane bridge, kind of like a shortcut- for those who actually try really hard). Why do I say this? Well, the whole article is here to tell you and also guide you on how to know what your real ambition is. So, by saying going through the 4 years study, I didn’t underestimate the ones who went through it, but what I’m trying to say is that if you do well in SPM, you’ll get to your dream faster and of course, you’ll be happier to grasp your dreams in a shorter time. However, for the ones who have gone through the 4 years study, I absolutely and honestly salute them for their patience in achieving their dreams and how they are strong for not giving up in getting to their dream. So now, why, oh why, are we putting at stake all of our favourite television-series, all the great movies, all those best of all time tracks of songs, our phone and our computer, just to ace SPM? There’s one single and simple answer to it. It’s because we have a dream. My dream is to go to US. What’s yours? It doesn’t matter, how impossible your dream might sound like, “I want to travel the world” or “I want to be the first woman prime minister in Malaysia”, these dreams, it is the main reason you want to ace the test, well, it’s actually the main reason why you start school at the first place. You have dreams, and you want it to come true. Therefore, there SPM is, lending it’s hand to help us get closer to our dreams, and here we are, thinking as if it’s a curse we were born with. So, some of my friends always said to me, it’s easy to talk, when the one who’s talking have a dream, but they cannot even figure out what they want to be in the future. Some even knows what to be, but still pursue in what they hate, all because of parent’s requests and other reasons. For me, it’s getting cliché in Malaysia, for a parent to decide their child’s future. But what we, as kids, can do is not just sit there, trying to be rebellious by failing every subject there is in school. When you hate it, you just hate it. Try to find what you’re most passionate about. It doesn’t matter if you love to draw, or you love to edit pictures, or you love to clean a house, or you love to cook, or decorate, anything that ranges from A to Z, if you’re passionate about it, don’t’ ignore it! Learn about it more and more, show to your parent’s that you’re really passionate about it rather than just saving thousands of files of poems and novels in your laptop and saying that you don’t want to be an engineer to your parents every single day (that’s what I did). Show them some of the things you’re passionate about, if you’re shy(well I am), spend more time on it, let them know you’re spending most of your time with it than anything, then they’ll get the clue you’re really on to it. Show seriousness, do research, talk about it a lot with them. Usually parents decide because either they dreamt of it, or because they see you tangled in a mess and confused and just blank of what you want to do for your future. Believe me, that’s the only main reasons why they set goals for YOU. So, if you’re the other case, which says that you don’t know what to be, and you’re now 17, start searching, RIGHT NOW. I’m serious about this. I’ve done research on it. In the earlier months of 2014, I was on the verge of choosing 6 different ambitions, all from 6 different types or streams, they’re just totally different. I was lost, and eventually, I lose reasons to study to. I find myself asking, Why am I studying? The same answer came, and it’s of course the so-famous “I don’t know”. So, after that, I got a bad result for my test, which includes one D in it. By that time, I cried then ask myself, what am I doing? Why am I sitting here and not search for the one thing I want to do in life instead? Then, I finally started to move. I read a LOT and ask people on the net what is this, and what is that. What I learned from all of that researches are the ones that have no capabilities or not great in anything finds searching for an ambition is hard, and the ones who are great in everything, finds it hard too. They know too much and love too many things that they don’t know which to choose. The one easy question that can help you through is “Do you like to imagine you living and working with only that in future?” If the answer is no, no matter if you ace the subject like crazy, you have to let it go. If the answer is yes, then, there, you find your true love. In my case, I’ve always get A and A+ for add math, but, I don’t like the picture of me and add math only in the future. Instead, what I can imagine is me, writing and writing, and finally, I got the answer of what my ambition is all about. I hope you found this article helpful in order to decide what your dream is. And, don’t be too harsh on SPM, give it some appreciation sometime. Sharifah Najihah binti Syed Zainol Abidin (@najihah1997) is currently in the big 'SPM year' in the Science stream with an additonal subject of Tasawwur Islam. Writes about passion and love to pursue in dreams and future. Inspired by most of Nadilla Jamil works. Living in Petaling Jaya, currently in the High Performance School, SMK (P) Sri Aman. After SPM/form five, one finishes secondary school and needs to complete a pre-university programme before one can enrol into a degree course. STPM/form six, A-levels, matriculation, diploma, foundation, IB, SAM, ICPU etc are all pre-university programmes, each with their own syllabus, unique programme structure, varying duration of study and different cost. Diploma is actually one of the many pre-university (pre-u) options available before someone enters a degree programme. Some diploma programmes are actually being offered by full-fledged universities and diploma students are studying at the same universities like degree students (undergraduates). Taking diploma programme is not necessary a bad choice and might not result in wasting time as the author implied. Case in point: an engineering diploma at UTM will take 3 years time to complete, which is longer than STPM which take 2 years to complete. However, when an engineering diploma graduate enrols into an engineering degree programme at UTM, he/she can skip a few modules and will be able to complete the degree programme in 3 years instead of 4 years for a STPM graduate who enrols the same degree course. In fact, taking diploma programme can be a smart choice for those who have already decided what to study for their degrees. Some people prefer to take diploma programme because they get to learn about the specific subjects that they are passionate about, instead of STPM which is quite general in terms of subjects. For example, a engineering diploma will offer specific engineering subjects like Engineering Theories and Principles, and Engineering Mathematics whereas for STPM you only get to study the general Physics and Mathematics. Our thoughts on how to choose what to study after SPM? Follow these practical advices by KC here and start visiting our website to use our Global Course Search widget to search more information on the courses you are interested, FREE for a limited time! 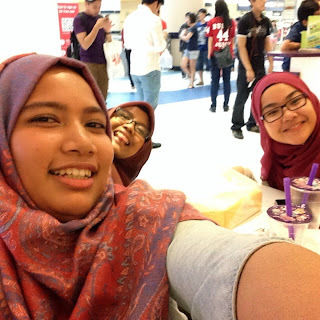 We thank Sharifah Najihah for sharing her personal tips on how to choose what to study with us. You too, can share your stories with us: email your articles to us, get published here and be read by 100,000 monthly readers and 22,000+ email subscribers. I really need help , i'm a science student and until now i didn't have any ambition and i don't know what course i want to take after SPM. . my teacher advise me to take finicial management because they said i'm OK with that. but i did't have any basic about account . so how? thanks for the article.to be honest,i dont actually know what i want to be.i currently in form 3 and im going to sit for PT3 this year.i want to go to science stream next year because i know science is me and im science (i really like science).but the problem is i dont know what my ambition is...until now,i just studied without knowing any particular reason why i study..i actually have this feeling of wanting to be a doctor but im not sure whether i really want to be a doctor.for your information,im lazy and i cannot get serious when it comes to studying..eventhough im like this,i can still get a good result..but i know this will not last long...can u help me? Try to follow the advices here. Also, read the comment section for additional tips. here's my problem : i really want to be a doctor,but i dont really like science plus i always got D or G for addmath,physic chemistry,i also never get A OR B+ FOR Biology.what should i do? should i just changes my ambition?